“Now I know how the Asahi Shimbun goes about twisting things.” This was my frank impression to how a statement by Deputy Prime Minister Taro Aso was recently reported by the influential daily. As sponsor and host of the seminar during which the deputy prime minister made his statement, I cannot help but feel that, as I discuss further below, the Asahi very cleverly distorted Aso’s remarks from what most of us present understood him as intending to say. On July 29th, the Japan Institute for National Fundamentals (JINF), a privately financed think tank for which I serve as president, hosted a monthly seminar entitled “The Path Towards Japan’s Rejuvenation.” It marked an occasion to discuss how Abe’s LDP, which has won three major elections in the past eight months – the lower house, Tokyo municipal assembly, and upper house elections – may overcome the growing crises facing Japan and bring about a national renewal. 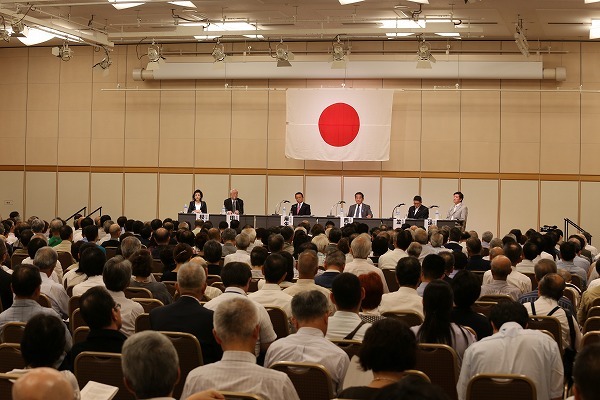 A rejuvenation of Japan will be unattainable without revising the current constitution, which is incapable of safeguarding the nation and its people, and it was therefore quite natural that the organizer made a revision of the constitution the main subject for the seminar. Because we at JINF expect the triumphant LDP to steadily pave the way towards a constitutional revision, which is its party platform, we eagerly looked forward to an active discussion that day in favor of a revision with the deputy prime minister. When the seminar actually began, however, I felt there was no small gap of perception pertaining to the revision between Mr. Aso and the members of JINF, including myself. In fact, even before the seminar the honored guest had attempted subtly to keep us in check by saying, “I guess am a left winger,” well aware that we had been openly advocating a revision of the constitution. At the seminar itself, Aso again noted in his remarks that “some people wonder if I may not be a left winger,” leading into a warning against over-enthusiasm for a revision of the constitution. I took his comments as a message to us that his position vis-à-vis the proposed revision was different from ours, which of course advocates a speedy revision. “I don’t want to see us rushing to a decision on so important a matter,” Aso went on to say. “Making changes in the passion of the moment would be extremely risky…Pardon my harping on the same subject… but let me repeat that I would hate to see any decision (on a revision of the constitution) reached in a raucous and frenzied atmosphere…” Mr. Aso repeated similar assertions five times during the seminar. The truth of the matter is that it is those who support the current constitution who have been frenzied. Those favoring a revision in Japan, beginning with members of the LDP, have managed to keep their cool— far from being frenzied. As a matter of fact, the LDP has remained too cool for too long. Now is the time for them to become more committed and enthused about revising the constitution. In other words, not only myself but also most of those attending the seminar felt Aso’s statement clearly gave the impression of a negative posture towards a constitutional revision. However, the Asahi gave a totally different interpretation to his remarks. For instance, the columnist for “Vox Populi, Vox Dei” in the paper’s August 1st edition wrote: “Mr. Aso’s statement, if one listens closely, is tantamount to arguing that Japan should emulate the method with which the Nazis stealthily and systematically destroyed the democracy of pre-war Germany. ” I wonder how it ever is possible to interpret his remarks as admitting his readiness to learn the Nazi method “with which to destroy democracy stealthily and systematically” – if one “listens closely” to his statement in its entirety. It truly boggles my mind. The ingenuity of imagination on the part of the columnist leaves me speechless. The Asashi has long been recognized for the supposedly high standard of its reporting. I must have given too much credit to the daily, as I least expected the Asahi reporter who covered the seminar to fail to fairly make out what Mr. Aso really had to say. But the daily tried to make the deputy prime minister – and Japan itself – a laughing stock in the international community by eliminating what preceded and followed his statement, which was clearly a verbal blunder, ignoring the meaning of his message in its total context. In its posture, I see no sign of awareness on the part of the Asahi that it is a responsible public institution. I suppose the Asahi stands ready to create one new historical problem after another from now on, as it has before, continuing to throw cold water on our campaign to revise the existing constitution. One cannot but entertain such a suspicion because other newspapers in Japan have also pointed to other cases of the Asahi ’s distortion of facts in its reporting. A typical example is a succession of reports by the rival Yomiuri Shimbun – another mass circulation newspaper – dated May 14th and 15th this year, in which it charged that inaccurate reporting by the Asahi had politicized the so-called “comfort women” issue in favor of nations like China and South Korea. 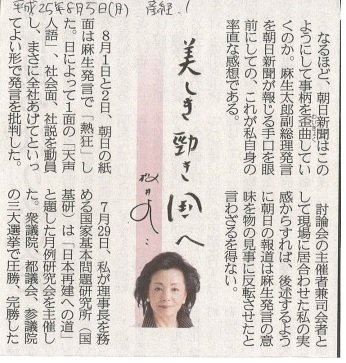 While such criticism of the Asahi by the Yomiuri is rare, the Asahi has yet to respond to the charge. If one is concerned with historical facts, an Asahi report of 1945 requires scrutiny, although it is a somewhat old story. Five days before the end of the Pacific War, on August 10th, a Japanese government announcement was released, indicating Japan’s imminent defeat, with journalists including the editorial director of the Asahi obtaining this information immediately. Newspapers naturally had the responsibility to relay the news of the possibility of Japan’s defeat to the people as swiftly as possible. On the contrary, the Asahi dared carry an editorial one day before the defeat, on August 14th, stressing the war effort must continue on and that the will to fight had to be lifted even higher than before. I think it is fair to say that this was a matter of criminal betrayal of the people of Japan. This case, which seriously questions the Asahi’s awareness of its historical responsibilities as a public institution, is detailed in a 262-page book well worth reading – The War Responsibility of the Asahi Shimbun (Shozo Yasuda and Kotaro Ishibashi, Ota Shuppan Publishing, Tokyo; 1995). Given its behavior and its seeming lack of desire to reflect on its actions, it is impossible to make excuses for the daily, even if we are talking about the Asahi Shimbun. I feel it is absolutely unacceptable for this newspaper to impair Japan’s national interests by creating yet another groundless controversy over an historical issue, this time based on the loose words of the deputy prime minister. Will the LDP be yet again immobilized before the criticism of its adversaries like the Asahi, China, and South Korea? The need for an urgent revision of the constitution is self-evident in light of Japan’s regional situation, which reflects the threat from China, animosity from South Korea and North Korea, and the increasing domestic orientation of the US. And yet, there is a mood in this country stressing the importance of a “cool-headed debate.” Does that by any chance mean that many of the LDP members, including Mr. Aso, are opposed to a constitutional revision? Do they intend to close their eyes to the crisis Japan is faced with, put aside the principles on which the party was formed in 1955, and slacken their pace toward a revision? If so, will they not be acting just as the Asahi hopes? Will the LDP really allow itself to settle for this? This is my most vital concern at this juncture.